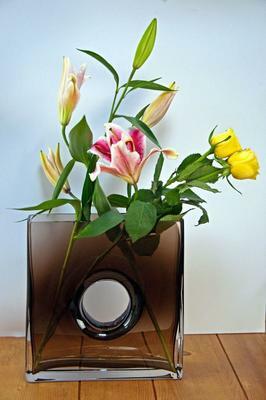 This modern vase is designed to look elegant in any room of your house. It's short and squat which means you'll have a lot of different options with where you choose to place this unit. 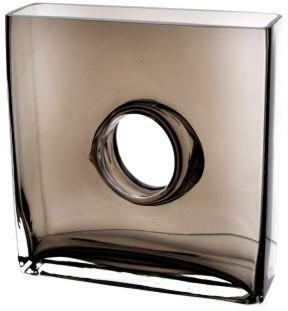 The square shape of this vase not only gives it a unique modern look, it also gives this vase a very solid stance. The square base of this unit means that you won't be able to accidentally tip it over. In the middle is an eye catching drilled hole, adding to the striking quality of this piece. 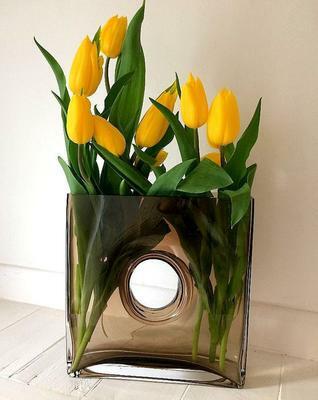 This whole vase is made out of a semi-transparent glass. This high quality glass imparts a nice look and won't chip or break with normal use. We recommend washing by hand so that this piece keeps its sheen. Height: 25 cm. Diameter: 8 cm. Weight: 2600 g.